When you live alone you develop routines and rituals. At least that has been my experience. I don’t know when I started the ritual of reading F. Scott Fitzgerald’s The Great Gatsby on the first day of summer, but I know exactly why. On page 11 of The Great Gatsby, during a dinner party fraught with marital mystery and tension, Daisy Buchanan says, “I always watch for the longest day in the year and then miss it.” Her friend Jordan Baker replies, “We ought to plan something,” and yawns. I didn’t yawn. Like Daisy, I often watched for the longest day of the year – the first day of summer – and then forgot it until it was past. On my third or fourth reading of The Great Gatsby, that passage resonated with me and, following Jordan’s bored advice, I made a plan: I always read The Great Gatsby on the longest day of the year. I can’t remember exactly when I started that ritual – probably in the late ‘70s – but it continues to this day. And I have never missed the longest day of the year since. William Faulkner is my favorite writer (good Southern boy that I am) but I think Fitzgerald’s The Great Gatsby is the most perfect American novel. It’s a short read; I can knock it out in about three hours. But it is so compactly and intricately structured that I never tire of it even though I have now read it upward of forty times. I always discover something new or respond to something I never responded to in previous readings. I first read the novel in high school and, unlike many young readers, I loved it immediately. I studied it again in college and then found myself drawn to it periodically after those initial readings. And then I developed my summer ritual. I love summer. I love the heat and the sweatiness and the long days and the outdoor activities. In my part of the South, many people seem to relish complaining about the heat and humidity of summer but I cherish it. I’d rather be too hot than too cold any day. So not only does The Great Gatsby represent my literary tastes, it has also come to represent my favorite time of the year. The reason I am talking about the beginning of summer at the end of summer is because I am winding down the summer of 2014 with a book that is about The Great Gatsby and that I am thoroughly savoring. Literary critic Maureen Corrigan has authored a new book, So We Read On: How The Great Gatsby Came to Be and Why It Endures, that is an extended meditation and exploration of Fitzgerald’s masterpiece. It amuses me that Corrigan’s book exploring The Great Gatsby is twice as long as the novel itself. It turns out that Corrigan may be an even bigger fan of the book than I am although she admits to not liking it in high school. I heard Corrigan tell an interviewer that she has read Gatsby at least fifty times and I knew I had to check her book out. It was worth it. And reading it now, three months past the first day of summer, is giving me a nice way of transitioning to ever shorter days and ever dropping temperatures. I must admit that the only thing that bothers me on that first day of summer in June is the knowledge that the second day of summer will be a bit shorter, and the next shorter still as we take the plunge to the shortest day of the year in December. The Great Gatsby itself takes place over a summer season. In the first pages the narrator, Nick Carraway, comments that “life was beginning over again in the summer.” Toward the end, he mentions that “there was an autumn flavor in the air” on the day that Gatsby is killed. 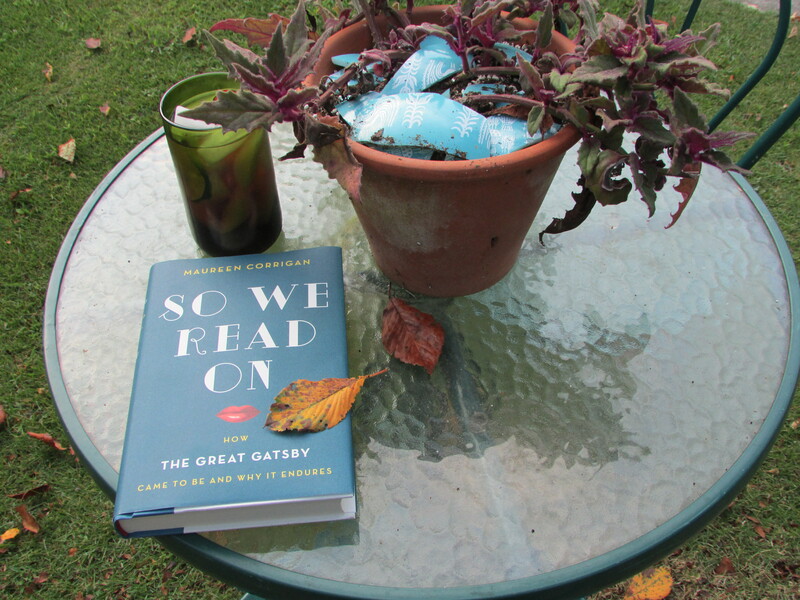 Maureen Corrigan, in So We Read On, has provided this reader with the perfect way to ease into the fall. “So we beat on, boats against the current, …” Thanks, F. Scott. And thanks, Ms. Corrigan. This entry was posted in literature and tagged F.Scott Fitzgerald, literature, Maureen Corrigan, So We Read On, The Great Gatsby on September 18, 2014 by gedwardjourney.